Just the phrase "head lice" is enough to make your head itch. However, if you happen to be one of the thousands that contract this irritating menace, you might wonder how to clean your bedding, including your mattress. While it might seem like this is an impossible task, getting your bedding lice free just takes diligence. Unlike fleas, head lice aren't jumpers. Therefore, where they go is limited to crawling. And being on a human head is there happy place. According to the CDC, head lice won't survive long off of the human head. How Long Can Lice Live on Bedding? You don't need to clear your bank account on expensive cleaners. Gather a few simple supplies and you'll be ready to go. Remove all your bedding. This includes sheets, blankets, pillows, duvets, skirts, etc. Strip your mattress down to nothing. Wash anything that can be washed. Pillows, sheets, pillow cases, blankets, bed skirts, etc. can all be thrown in the washer if they are washable. Wash everything in hot water and dry them for at least 45 minutes on high. If you can't wash an item, at least dry it for 30-45 minutes. The heat will kill the louse and nits. Anything that can't be washed, stuff into the garbage bags. These will need to sit for at least 7-10 days to ensure that all the louse and nits are dead. Therefore, if you can dry it, you should. This will allow you to use your items immediately. 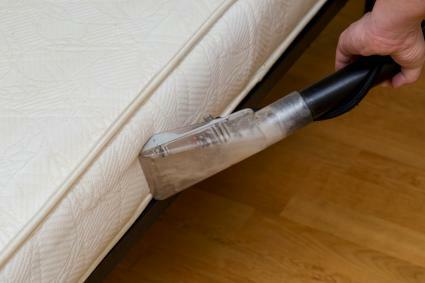 Vacuum your mattress. Pay special attention to all the creases in the mattress. These are the easiest areas for the louse to gather and hide. Make sure to vacuum the mattress thoroughly. Remake your bed using the freshly laundered bedding and pillows. While you will want to clean your bedding thoroughly after your initial infestation is found, you will also want to repeat these steps if there are any re-infestations. This will need to be done for all bedding in the house. It is also helpful to put sealed bedding in an area of the house that won't be used, like a basement or closet. If you don't trust that just vacuuming and drying are going to cut it, then you can try either homemade or store-bought sprays. These are also great as a preventative measure. Most store-bought sprays contain insecticide like in shampoos; therefore, a do-it-yourself spray might be the way to go. Combine the bleach and water in a spray bottle. Shake lightly to mix. Try this on a small area first to ensure that this will not harm the material. Once you've done the test, start spraying the bedding generously. Combine the water and the oils. Spray the homemade solution on your bedding and mattress. You can even use this on your head. Lice are a horrible nuisance that affects typically school-age children. While these little menaces can't run or jump, they can crawl. Therefore, they can fall off children's heads on bedding. However, you can take comfort in the fact that they won't live long. Getting rid of them is just a matter of throwing your bedding in the dryer and giving a good vacuuming to mattresses. However, if you want a prevention spray, there are a few DIY recipes out there.